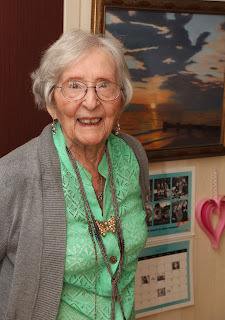 Lucille Samia stands in front of her favorite oil painting. An artist, dressmaker and lifelong learner, she turned 104 on September 27. Lucille Samia smiles easily and listens intently. Her laughter is infectious. The three-year resident of Fauquier Health Rehabilitation & Nursing Center (FHRNC) celebrated her 104th birthday on August 27; she says she owes her long life to exercise, strong relationships, and a diet that includes lots of vegetables. She is the poster child for clean living. Mrs. Samia uses a walker to hustle to the different activities she engages in at FHRNC, but she moves well without it. “It gives me a sense of security. I don’t want to fall,” she said. But Mrs. Samia can get around pretty well if she wants to. When she heard that there was going to be luau at FHRNC last Friday, she even obliged with a convincing hula dance (sans walker) just to get in the spirit. The couple met when Fred Samia’s date needed a dress for a big dance. He sent her to Lucille, who was a talented dressmaker. Later, he came into the dress shop and asked her on a date. They were married in 1940.